I am super stoked to be traveling to Europe with my family for Spring break. It's my absolute dream vacation. We talked about this trip years ago and I can't believe it's finally happening. For a week long trip, we decided that we will be traveling with carry-ons only. By doing so, not only will we be saving a ton of time but also able to avoid checked bags fees and lost luggage incidents. In order to fit everything in a carry on, you must plan ahead. 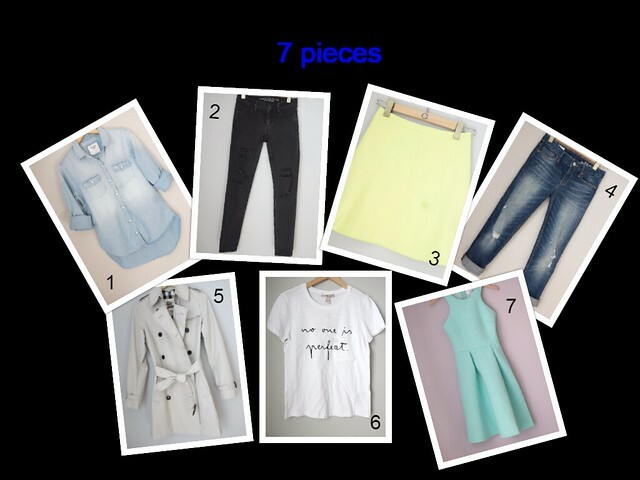 Below is how I use 7 pieces to put together 7 different outfits. 6. Graphic tee - This tee is another item that I picked up last week and love! I got it in a size small and it has the perfect "oversize" fit. 7. c/o ASOS green skater dress - Since most of my outfits are more on the casual side , I decided to bring something a little dressier to wear to dinner. We booked a dinner cruise for one of the nights in Paris and I am planning to wear this dress. I am bringing with me one pair of boots (to wear on travel days), one pair of slip-on sneakers and one pair of high heels (to wear on a riverboat dinner cruise only). I originally planned to bring my Tieks flats but am afraid they don't provide enough support for walking around the city all day. The boots I plan to wear with outfit #5 and #6 on travel days are with the cobbler at the moment (hence why I am barefoot in both photos). I also picked up these slip-on sneakers from Target and they're like heaven for my feet (currently buy one get one 50% off). I hope you find this post helpful. Next, I will talk about how I fit everything pictured here plus the rest of my stuff into one carry on. Stay tuned! How exciting! It would be so hard to pack with just a carry-on! All of these outfits are so cute and perfect for your trip! I love your citron skirt! Love it! I always try to only pack in a carry on.. it takes more effort but it is always worth it! Great tips and outfit ideas! I don't know about Paris but I'm in the UK and it can be chilly and wet in northern Europe in Spring. I would suggest another layering piece like a light jacket or cardigan that you could wear over your tops or your dress and under your trench. Maybe also a scarf or two .. and socks or tights. These pieces could also be worn on the 'plane as flights can be cold. Have a fab trip anyway! I will definitely bring along a sweater/sweatshirt of some sort for layering and traveling. Instead of the short-sleeved tee, I will bring along a couple of long sleeves (one to wear for travel days; and one as backup). @Anonymous Thank you =) Aruba sounds really wonderful. I'll post lots of photos after the trip. Have a great time in Aruba! @Anonymous, @soupdragon, @jolecole Thank you so much for the tips. I definitely will pack a few more warmer pieces with me. Your outfit choices would be better for late spring/early summer. I highly suggest packing a few warmer pieces. The windchill can make a 60 degree day feel like 45. Also, I would wear short wedges or flats (both boots and regular shoes) for walking around the city. The streets are not well-paved like those in the U.S. There are also lots of stairs/steps to climb. I just got back from a week in Europe and would love to know how you get by with so little! I packed things that would mix and match so I could adjust to the weather (and found that the temperature was much cooler than expected overall but fluctuated quite a bit during the day - I was constantly adding and subtracting a layer). Do you wash your tops out at night or send them to the hotel laundry? After traipsing around all day, getting rained on a few times, and the inevitable spills that I'm too good at lol, I never felt like my shirts were fresh enough to wear a second time. I took 3 pairs of pants, 3 pairs of shoes and a different shirt/sweater to wear each day (sometimes with repeated cardigans). I wore every single thing I took except a couple extra pairs of socks and undies. When you get back, I'd love to hear how it went and how you made it all work! Have fun!